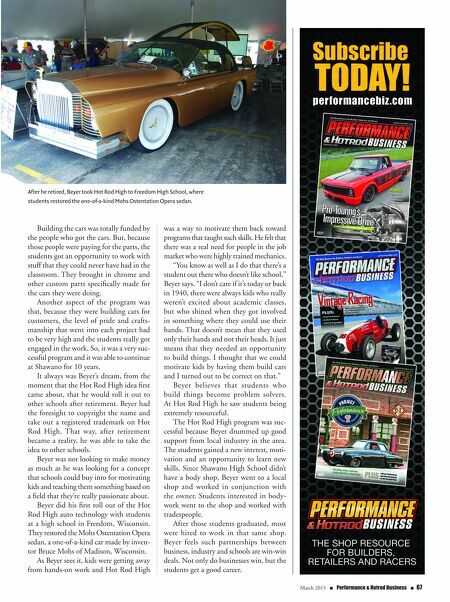 March 2015 n Performance & Hotrod Business n 67 Building the cars was totally funded by the people who got the cars. But, because those people were paying for the parts, the students got an opportunity to work with stuff that they could never have had in the classroom. They brought in chrome and other custom parts specifically made for the cars they were doing. Another aspect of the program was that, because they were building cars for customers, the level of pride and crafts- manship that went into each project had to be very high and the students really got engaged in the work. So, it was a very suc- cessful program and it was able to continue at Shawano for 10 years. It always was Beyer's dream, from the moment that the Hot Rod High idea first came about, that he would roll it out to other schools after retirement. Beyer had the foresight to copyright the name and take out a registered trademark on Hot Rod High. That way, after retirement became a reality, he was able to take the idea to other schools. Beyer was not looking to make money as much as he was looking for a concept that schools could buy into for motivating kids and teaching them something based on a field that they're really passionate about. Beyer did his first roll out of the Hot Rod High auto technology with students at a high school in Freedom, Wisconsin. They restored the Mohs Ostentation Opera sedan, a one-of-a-kind car made by inven- tor Bruce Mohs of Madison, Wisconsin. As Beyer sees it, kids were getting away from hands-on work and Hot Rod High was a way to motivate them back toward programs that taught such skills. He felt that there was a real need for people in the job market who were highly trained mechanics. "You know as well as I do that there's a student out there who doesn't like school," Beyer says. "I don't care if it's today or back in 1940, there were always kids who really weren't excited about academic classes, but who shined when they got involved in something where they could use their hands. That doesn't mean that they used only their hands and not their heads. It just means that they needed an opportunity to build things. I thought that we could motivate kids by having them build cars and I turned out to be correct on that." Beyer believes that students who build things become problem solvers. At Hot Rod High he saw students being extremely resourceful. 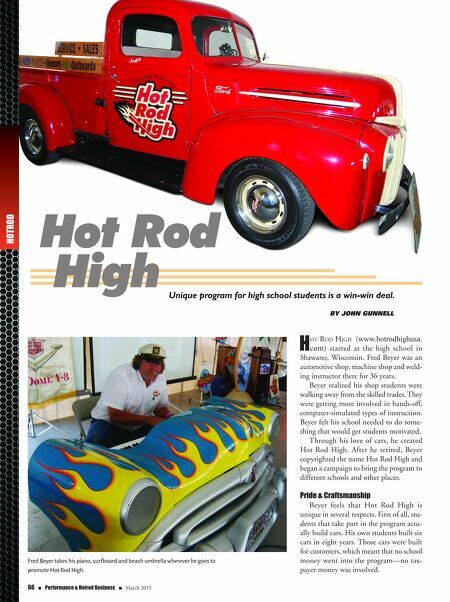 The Hot Rod High program was suc- cessful because Beyer drummed up good support from local industry in the area. The students gained a new interest, moti- vation and an opportunity to learn new skills. Since Shawano High School didn't have a body shop, Beyer went to a local shop and worked in conjunction with the owner. Students interested in body- work went to the shop and worked with tradespeople. After those students graduated, most were hired to work in that same shop. Beyer feels such partnerships between business, industry and schools are win-win deals. Not only do businesses win, but the students get a good career. After he retired, Beyer took Hot Rod High to Freedom High School, where students restored the one-of-a-kind Mohs Ostentation Opera sedan.